Cartography or map making is a very important project of our group. Detailed cave maps are useful tools for all the scientific work going on at the cave. From plotting bat colony roosts and paleontological digs, to predicting cave passage trends and managing surface usage; cave maps enable educated decisions. A variety of varying quality Cathedral cave maps have been produced over the years, but it is our goal to create the highest detailed maps possible. Our ongoing surveys will result in detailed maps and computer based GIS databases. 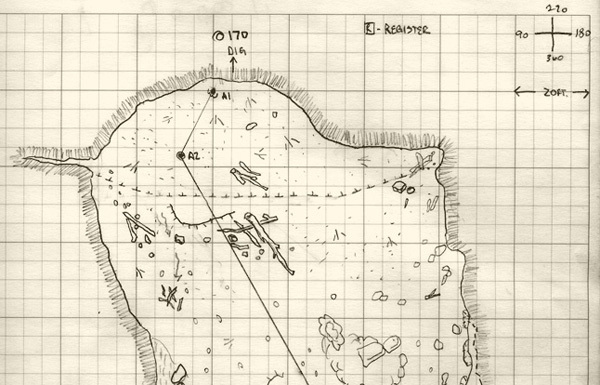 Below is an example of one of our earlier survey sketchs. In reviewing the data, it turned out that we had some problems with our survey methodology. So we will be going back and surveying the caves again with new methods, higher detail, and advanced survey equipment. We will also be surveying the land surface above the cave so that we can further understand the geologic relationships between the cave passage and surface features. We have already plotted radio locations between the cave ends and corresponding surface points.